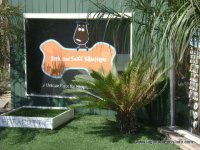 Just about everything is Laguna Beach Dog Friendly! Jump to sections on this page! 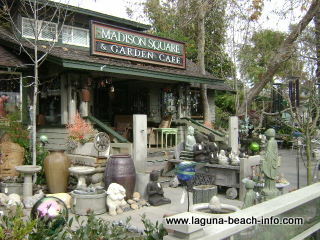 Many outdoor restaurants and shops in Laguna Beach are pet friendly! You'll be amazed at how many establishments have water dishes and treats for your dog, and how welcoming stores are to you and your pup! 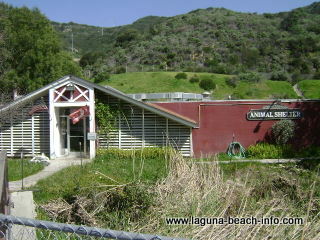 In a town that's as "dog crazy" as Laguna, of course you can find specialized Laguna Beach Dog Stores!!! There are several pet shops in town dedicated to providing you everything you need to pamper your pup! Bark and Sniff Boutique is a unique store that caters to the needs of dogs, and even has dog portraits on display hanging from the walls! They have freshly baked dog treats, training tools, dog apparell and everything else you can imagine for your dog. The Dog Company is another great store dedicated to dogs. From dog costumes, supplies, rainboots, and everything else you can imagine for your dog. Laguna Beach Dogs Love the Beach! 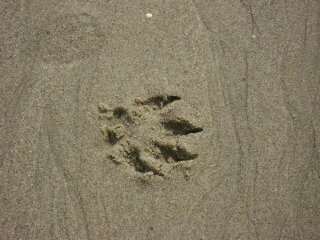 Just about every beach in Laguna is "dog friendly"! One of the most amazing things that many dogs enjoy is taking a romp on the sand and frolicking in the surf! During the busiest summer months (June 1 through Sep 15) dog owners may only bring their canine companions to the beach before 9:00am and after 6:00pm. During the rest of the year, feel free to bring your dog to play on the beach anytime of day! Each beach has specific rules posted at the entrance. Find out everything you want to know about each specific Laguna Beach beach. Certified pet sitter with years of experience and offering multiple in-home services to take care of every need while you're away from home! 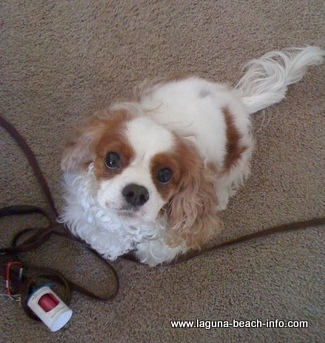 Check the link for this Laguna Beach dog sitter to find out more! Offering multiple services to take care of your Laguna Beach dog, cat, or other pets; including playtime, clean-up, and medications. Check the link for rates and services. Call to find out the wide-range of services available for all pets! 45-90 min walks, visits to the veterinarian or groomers, overnight stays at your home. 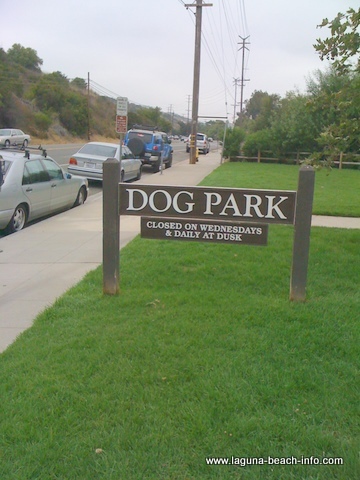 also known as "Bark Park"
After crossing the entrance bridge and going in through the double gate into the Laguna Beach Dog Park, your dogs can frolic, romp, and play unleashed with their canine friends! If you love being outdoors with your dog- you might enjoy taking your dog on hike in the hills of the Laguna Coast Wilderness Park! These are some of the hills that rise up from behind the Laguna Beach Dog Park. The first thing to keep in mind, is that in an effort to protect the indigenous wildlife, dogs are not permitted on all the trails. There will be signs posted at the beginning of the trailhead to indicate whether dogs are allowed. 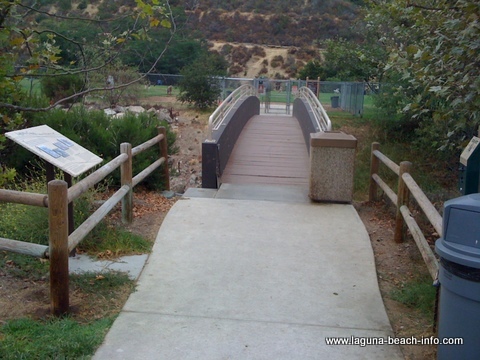 For example, dogs are restricted from the trails at the canyon floor of Aliso and Woods Canyon. Dogs on-leash are permitted on the West Ridge Trail that runs along the top of the ridge, looking down upon Laguna Canyon Rd and the Bark Park below. This is a fun trail with plenty of ups and downs that takes about 35 minutes in each direction, so make sure that you have at least an hour and 10 minutes of sunlight left in the day before you start. Unless you have flashlights or a full-moon, hiking in the dark is no fun! After all this activity in Laguna Beach, your dog will love a Massage! Your dog will enjoy a Dog Massage! Getting your dog a massage increases circulation, aids in eliminating wastes and toxins, and increases immune system activity which all translates into a healthier, happier dog! Or if you'd prefer Pawsitive Feelings can come out directly to your home or hotel and provide a relaxing and rejuvenating massage treatment for your dog! 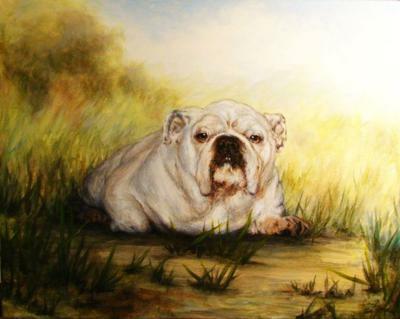 Get a portrait painted of your pet by a fabulous artist in Laguna Beach. Tony Goodwin is an expert at multiple mediums and can render amazing portraits. Adopt a Laguna Beach dog, cat, or bird! The Laguna Beach Animal Shelter (in collaboration with PUP Laguna Beach) is a non-profit organization which is dedicated to improving the care of abandoned and neglected pets in Laguna Beach and Laguna Woods. If you are thinking of adopting a Laguna Beach dog, cat, bird, or other small animal to your family, come meet some of these amazing animals! There is an application screening process to verify that these animals will be placed in the best homes possible. After filling out the necessary paperwork, the screening process may take a few days, during which you can visit with your new "family member" in the play yard! The shelter is open 7 days a week from 11:00am to 4:00pm. The "play yard" is available from 11:00am to 2:00pm each day. Do You Know of Laguna Beach Dog Friendly Recommendations? If you have more recommendations or stories to share about Dog Friendly restaurants, shops, beaches, parks, or activities in Laguna Beach- Share them Here! 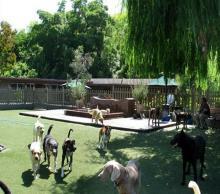 If you operate a business that serves the dogs and Laguna Beach dog lovers... let us know so we can add your info! 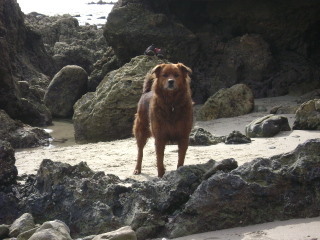 And of course- If you just want to share photos of your dogs playing in Laguna Beach, feel free to post them here! Enter The Title of YOUR "Dog Friendly" Recommendation or Experience! If you're a dog lover, you may find current news and postings about dogs interesting and educational! We compile any recent breaking news about dogs and put it all in our Dogs in the News section, so you can easily find all the dog news in one place without having to search all over the internet! 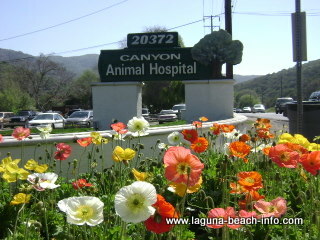 Return from Laguna Beach Dog Friendly to the Laguna Beach Info Home Page.